Japanese car maker Toyota is following US automotive maker Tesla Motor’s lead (which opened up fuel cell technology for electric vehicles last year) and opening up to 6,000 fuel cell and related patents to the rest of the automotive industry for royalty-free use. It said it took the step in a bid to drive development of cars that use the alternative fuel source. The announcement was made soon after it showed off its Mirai hydrogen-driven car at Las Vegas’s CES show recently. The patent portfolio covers fuel cell stacks, high-pressure hydrogen tanks, software control systems and the industrial processes involved in generating and supplying the gas. The list includes approximately 5,680 patents including 1,970 patents related to fuel cell stacks, 290 associated with high-pressure hydrogen tanks, 3,350 related to fuel cell system software control, and 70 patents related to hydrogen production and supply. “At Toyota, we believe that when good ideas are shared, great things can happen,” Toyota VP Bob Carter said in a statement. He added that the first generation of hydrogen fuel cell vehicles, which are expected to be launched over the next five years, would require "unconventional collaboration" among car makers, governments, power firms and researchers. “By eliminating traditional corporate boundaries, we can speed the development of new technologies and move into the future of mobility more quickly, effectively, and economically,” he explained. The hydrogen fuel cell patents will be made available to automakers who want to produce and sell fuel cell vehicles, as well as to fuel cell parts suppliers and energy companies who want to establish and operate fueling stations through the initial market introduction period, anticipated to last until 2020. 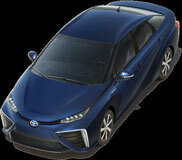 On its website, Toyota states that it has been designing its fuel cell technology for 20 years. Toyota says patents related to fuel cell vehicles will be available for royalty-free licenses until the end of 2020. Patents for hydrogen production and supply will remain open for an unlimited duration. 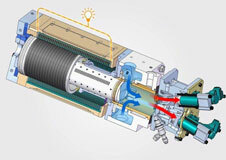 For now the patents will only be made available to those within the fuel-cell vehicle industry. Any company outside of the industry that wishes to use the patents will be evaluated on a case-by-case basis. As part of the licensing agreements, Toyota will request, but will not require, that other companies share their fuel cell-related patents with Toyota for similar royalty-free use. Toyota’s first concept car for this technology, the Toyota Mirai, will be available late 2015.